The Visual Studies Platform and the Verzio International Human Rights Documentary Film Festival cordially invite you to the screening of the films created in the course of this year's Verzio Doclab. 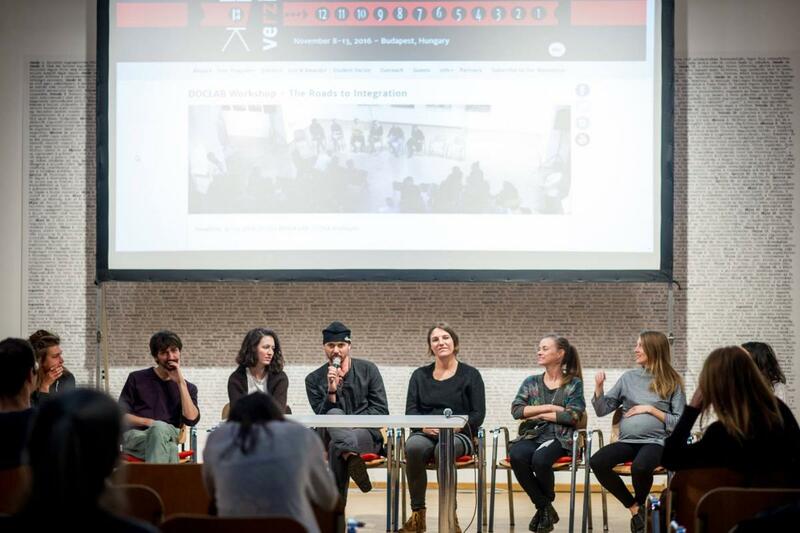 Participants of the 7 selected projects will work on a short doc, trailer, or scene during the workshop. The projects all have a strong thematic connection to human rights. The screening will give you a glimpse into the newest documentaries in production, and the audience can also gain insight into the creative process. Is it a feasible expectation to become Ferenc Szabó when once you were Ali, the Yezidi refugee? The film shows sacrifices and struggles that has to be faced when someone has to leave his previous life; one has to turn away from the former habits and has to learn how to adjust to completely different living circumstances. What inner conflicts does one have during integrating to a foreign country? “My mom, her summerhouse and other stuff” is a short documentary about the filmmaker's mother - Lubov, her summerhouse and everything what happens around her in provincial Russian town where she lives. She made her way from a factory worker to the management and now she is facing a retirement, as the new factory managers want to get rid of the aged staff. In preparation for the retirement and pension misery as an inevitable result, Lubov bought an old summerhouse with a garden attached to it, where she's planning to grow her own vegetables. This film is not only an intimate portrait of an aging Russian woman but also about provincial Russia, which is still a mystery not only for the International audience but for the Russian as well. In a country where legal adoption is not an option for gay couples, two women still decide to start a family. “It's Her Story” gives a deep insight into the prejudices pervading our daily life through struggles of a lesbian couple who is adopting a Roma child in an exclusive, conservative society. “We Can Never Fall On Our Knees” relays the stories of three Roma Holocaust survivors, highlighting how they resonate with present-day experiences of intolerance as well as the survivors’ efforts of resistance. Among only a handful of remaining Roma Holocaust survivors, characters Raymond, Lona, and Peter each share different experiences that are connected by a common mission to advocate for equality and fight against contemporary anti-gypsyism and hate in a time of increasing intolerance. Ani Balikci (62), an Armenian woman from Istanbul, struggles for justice after she lost her son Sevag, to a bullet fired by another soldier, in 2011, while in military service. The film focuses on Ani's confrontation of her past and her change during her struggle for justice. Facing the realities puts Ani in a dilemma of leaving or staying in Turkey where her roots belong. “Endless Shadow” pieces together some of the world’s most iconic walls and border barriers – made of stone, brick and dirt, or of barbed wire, concrete panels, metal sheets. The film will present each one from a personal point of view through intimate human stories placed under the long shadows of this barriers. The presence of the walls and the stories of the people coexisting with them are linked together in the film and thus a broader, timeless human story. In this film, walls and theirs shadows do not only separate, but also merge destinies. See more at the Facebook page of the event.